Ever since Caroline was just a few months old, I've had a standing tradition with my mother-in-law to meet for lunch on Tuesdays. We almost always go to the exact same place. It's now Caroline's favorite restaurant, and she always asks to go to "The old restaurant with paintings on the wall." It's not anything groundbreaking, but they do really excel at lunch: their french fries are the best. They have great chicken salad sandwiches and burgers. And really awesome tomato-basil soup. We order it quite often, and one day, a few years ago, Caroline reached over and dunked her grilled cheese sandwich in it like it was nothing. See, even at two years old, Caroline knew what to do. Ever since then, I pretty much always order the tomato soup and give half of it to her for dunking (and subsequent slurping). When I made this soup for lunch one weekend, I told Caroline we were having tomato soup. Upon serving her a bowl, her first response was that it wasn't the "right" tomato soup. Meaning, it's not the same one she's used to. But let me tell you - there's nothing wrong with this soup. It's a cruel irony that when you crave tomato soup - when it's cold, rainy, and dreary - it's nowhere near tomato season. This soup combats that by using canned diced tomatoes. I chose to use fire-roasted because I think they are just awesome. In order to extract more flavor from them, they are sautéed with butter and onions, then the soup is built upon that base - garlic, a little sugar, tomato paste, and red pepper flakes. It's then bulked up by the addition of small pasta and finished off with lots of spinach. It's hearty, healthy, and totally comforting. And as if I even need to tell you - but a grilled cheese is required with this (and any) tomato soup. the soup will thicken upon cooling, so you may need to add a little extra broth when reheating. Melt the butter in a Dutch oven set over medium-high heat. Add the tomatoes and onion, and cook until the tomatoes are dry and begin to brown, 10-12 minutes. Add the tomato paste, brown sugar, red pepper flakes, flour, 1 teaspoon of salt, 1/2 teaspoon of pepper, and garlic, and cook until fragrant, about one minute. Slowly whisk in the broth and reserved tomato juice, scraping up any browned bits and smoothing out lumps as you go. Stir in the pasta and bring to a boil. Reduce heat to a simmer and cook until pasta is tender, 10 to 12 minutes, stirring occasionally. Stir in the spinach and cook until wilted, 1to 2 minutes. Taste and season with salt and pepper as needed. Serve. This soup looks absolutely fabulous! Awesome recipe! This sounds great, Josie. I love the addition of the spinach! Have a half a box of ditalini in the pantry too. Think I'll make a batch of this up for lunches this week! Oh, this soup looks so good. The picture made me crave minestrone immediately, since that's how I normally eat tubetti. But tomato and spinach sounds like a perfect plan too! 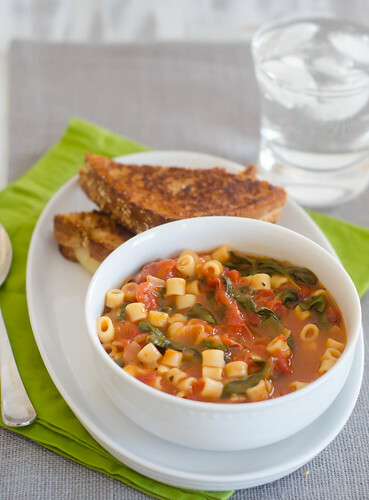 I love that the tomatoes are sauteed first - this soup looks perfect! I love how she just intuited that grilled cheese goes with tomato soup! that girl is totally a foodie in the making! Right now, this soup would make my entire life! It looks very yummy! Absolutely! The scones themselves were soft and tender, and rose sky-high during baking. The little pockets of buy a term paper online butter were little bursts of flavor. And as they came out of the oven, the scones were brushed with honey butter for some extra sweetness. Really wonderful taste. I and my family like it very much!